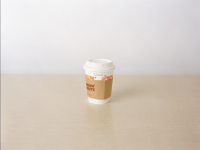 In Korea, when we took out coffee from a coffee shop, we used to pay 50 won(about 5 cents) for the paper cup- as an 'environmental fee'. And we could get the money back when we returned the cup to the coffee shop. 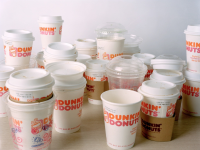 I had collected paper cups until the value of them reached as much as it would cost a cup of coffee - in the case of Dunkin Donuts, the number of cups needed 39. 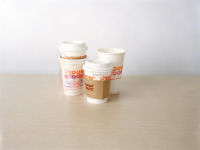 So I took 39 cups and exchanged them for a cup of coffee. After that process, one cup was left. Then I started collecting all over again.